Let’s just say, this has been my favorite costume we’ve ever done, and we’ve done some pretty fun costumes! I saw the costume idea floating around the internet and thought it would be pretty awesome if we could pull it off. I got my girlfriends together and asked what they thought and they were IN! Step 1: Complete! Step 2: Now what? We purchased a costume pack that included the green jacket, pants and helmet. We ordered combat boots that were black but knew we had to paint them for the full effect. Once the costumes were delivered, we visited the local hardware store to find paint that matched the material on the costumes for the other items. We found a glossy spray paint that matched perfectly. Step 3: Let’s Accessorize! We knew we needed grenades, guns, bullets, walkie-talkies, and a bazooka. Most of the items we were able to purchase online from toy websites and Amazon. Once everything was delivered, we had to first primer all of the items to ensure the green paint would stick. Once the primer dried, we went onto spray painting everything with 2-3 coats of paint. Step 4: Where the heck does one find a bazooka? We were able to find normal size toy bazookas but we really wanted one that was exaggerated in size. A friend was able to make one out of PVC piping and other plumbing pieces. The finished product was a little over 3 feet tall and it was PERFECT! It was one of the staple pieces of the costume. Step 5: The Base. My husband found some thin plywood and cut it into the shape of the toy bases. We had to put several coats of primer and paint on the bases to keep them shiny looking. Originally, we were going to screw our boots onto the plywood and then cut it in half so we could walk but feared we’d get injured. We decided to keep the base whole and carried it around with us. Step 6: It’s Go Time! We found green body paint (Mehron Green G) that matched perfectly. We put on about five layers of paint to make sure it looked thick- like plastic. Once we had our face paint on, the rest came together effortlessly. We went to a Halloween party and when we walked in, people went crazy! We could barely make it to our seats because we kept getting stopped for pictures. It was such a great feeling, we NAILED IT! 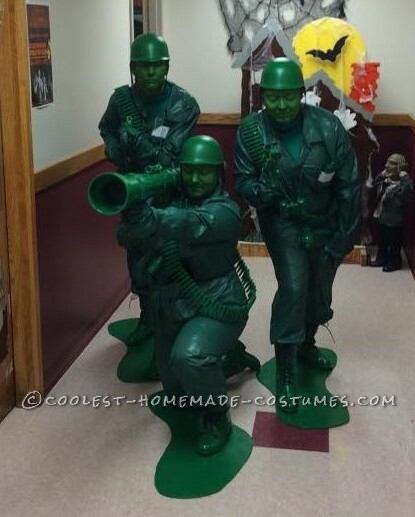 For an extra touch to our costume, the three of us handed out little green army men as we socialized. 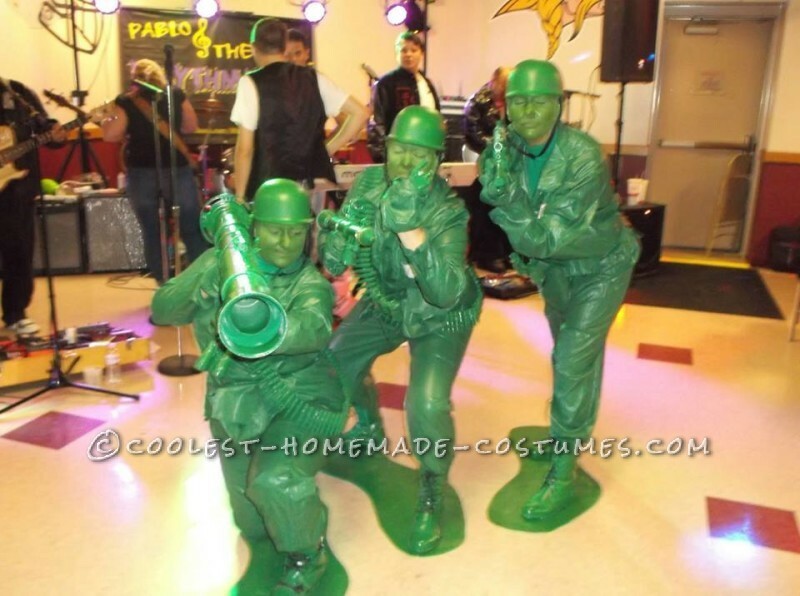 By the end of the night, there were 244 little green men scattered around the event.